For what purpose u have made stand u upvc pipe with holes. Pls tell. If only you would have posted this Message Earlier , I hope many of us would have loved to Visit , Watch , Learn and Assist from Scratch , Really Nice . I have gone through the entire thread and impressed on your project. Please share your contact details as I need an appointment to visit your farm and learn in details on Hydroponics. It’s wonderful!!! and encouraging too . Please share your address ,and how about training now in bangalore ? Where exactly in Bangalore is your farm based? I would love to see and learn from you how it works. I am interested in cultivating herbs hydroponically. It would be nice if I could get your contact details to speak to you directly if possible. Have you also thought about Aquaponics as you already have everything needed. I am in USA and doing some POC in Aquaponics and getting very good result. 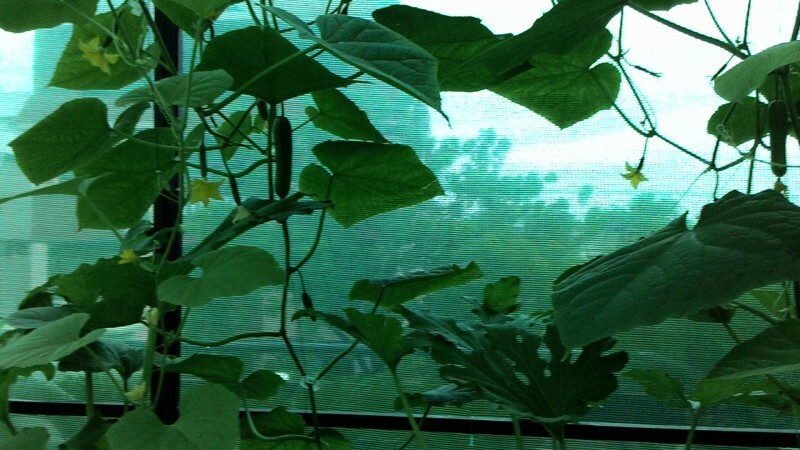 I tried using Kratky method and ended up with the first fruit on EU cucumber in 38 days from seeding. Have you attempted Kratky and what do you think of commercial viability of Kratky method. I am requesting you since a long time to visit your Farm. But I could not a response from you. Kindly provide an appointment to visit your Farm at your Convenience.I am from Hyderabad sir. Welcome any time, when u r here let me know we can catch up. Guys as i said i have started 2 commercial farming project ,one with soil and another Hydroponics. will update soon with details. Its great to check on this system on your roof top where people dont have much time to check on the nutrients and EC … , I would not advice on commercial viability as your yield will get lower on kratky system if you go for fruit bearing crops. One more is since you do not use any kind of air stone for O2 and since it does not circulate water ,the stand still water will accumulate salts and PH will become an issue. Also will become a grooming bed for the mosquitoes and other pest to lay eggs. This system is mostly advised for home users and that to only for greens and not for any fruit bearing crops. I am trying now the the large scale raft system , I dont know how convinced will i be on growing any thing other than greens using Aquaponics. It again depends on my current harvest …though produce lots of vitamins and proteins ,Vitamin “M” becomes an issue . I am from Hyderabad . since long time I am requesting Permission to visit your Roof Garden, under Hydroponic System. Kindly permit us to visit Bangalore at your Convenient Time. I am making this request since a long Time. Kindly Permit Sir. Planning to do some experimenting with hydroponics myself. You (and Hydro) mentioned “EU Cucumbers”. Can you name the particular seed / varieties that you grow? I can’t find any seed named or classified as EU. I would also appreciate recommendations on Tomato & Cherry Tomato cultivars well suited for hydroponics & for raw consumption. I grow rijzwan seeds, Multi Star cost 5.67 per seed. but i doubt you get them in small quantity. mail me your address as next week i am planing for replanting will send u few. How about starting a section where people can review and give ratings to seed varieties / cultivars based on their experience? There are a whole lot of seed companies, selling all sorts of seeds… its all very confusing to zero in on a particular cultivar. User experience will be (IMHO) quite valuable to other farmers. Now all we need is - the reviews! now working on some 6 locations in and around Bagalur. Green house using hydroponics as the method of cultivation. Growing cucumbers and now this time planing for a bit of other exotics and in open cultivating Beans,green capsicum and tomato,coriander. Too expensive for the size mentioned by you. The total green house cost (without growing stucture) should have been not more than Rs. 40000/-, this too being on the higher side. can you help post some visuals Vertical… they really help a lot. it helps understand faster also. have you hired someone or doing it yourself? Such structure had been prepared long time back on my roof top in Lucknow to keep herbal plants handy for sale to public.I wish to keep nature handy,helpful involving minimal costs.The 200 micron poly sheet is used during winters since winds are not very strong during this time.The same structure gets converted to shade net during summers when poly sheet is replaced and shade net spread.In summers wind speed is maximum(say nearly storm like).This ensures the structure remains safe from getting blown during strong winds.The hydroponic may be liked by my friends but I do not approve of it.The quantum of chemicals floating in the water in hydroponic solutions may make the vegetation look lush green but same is viewed as unhealthy.I do not know about others but effect of chemicals has not been appreciable on health.I leave it to my friends to follow the path they like.The ideal height of poles should not be more than 10 feet,since any height more than that becomes a strong wind barrier.The structure may get blown off, if height increases.Not only that the roof walls etc may also get damaged, causing some unwarranted accident in the locality.